Description:- "Baidyanath Arjunarishta contains Partha (Arjuna Chal), Mridvika (Draksha), Madhupushpa (Madhuka), and Dhataki. Arjuna Chal helps in reducing blood pressure and keeps the heart away from stress. This helps blood move into the heart at a regular pace. 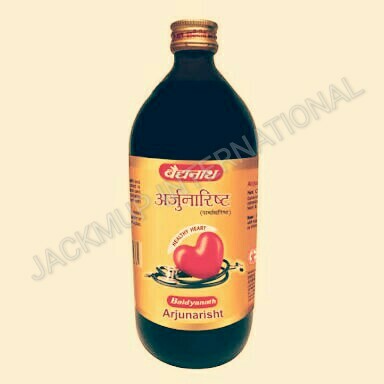 Baidyanath Arjunarishta is an Ayurvedic formula to ensure that the heart works normally and functions effectively. The mixture contains bioactive substances that enhance the functions of left ventricle. It also improves respiratory system as it reduces the stress on this part of the body. Owing to antioxidant properties, it prevents cell damage. Direction for use: A person must consume 15 to 30ml of Arjunarishta ayurvedic medicine twice every day. Oil and heavy foods should not be consumed after using this medicine product. Use under medical supervision."